Today’s POP RESCUE is the 1989 Merry, Merry Christmas album from five-piece American group New Kids On The Block. It’s worth noting that this 10 track album is mostly original, with only three of the tracks being cover versions. The rest, are mostly co-written by Maurice Starr (creator of New Edition, and legendary songwriter), who also has credit as producer. The album was their third, and released at their peak. It sold significantly well in the USA, and spawned two singles. First up, it’s lead single This One’s For The Children. Opening with the stern words of Jordan Knight ‘This is a very serious message, so all of you please listen’. Serious, yes, but the lyrics are somewhat cringeworthy – think, a more awkward version of Band Aid‘s Do They Know It’s Christmas? and you’ll have it, complete with key change and what sounds like a child choir. I could imagine this being nestled on Michael Jackson’s Dangerous album. Unsurprisingly it was released as a charity fundraising song. Second track brings in the Christmas sound with Donnie Wahlberg snarling Last Night I Saw Santa Claus. It’s a fun track, which at times during the chorus, reminds me of something from the Phil Spector Christmas album. This is followed by a flurry of strings that lead into a ballad sung by Jordan, Donnie and Joseph, titled I’ll Be Missin’ You Come Christmas (A Letter To Santa). Lyrically, this one is a vast improvement on the opening track, although there’s a few mentions of the word ‘christmas’ that seem to be hurriedly shoe-horned in. Vocally, at times, it sounds like the Bee Gees are contributing. Overall, this is quite a nice mellow little Christmas song. Kid New Kid, Joseph McIntyre takes lead vocals on next track I Still Believe In Santa Claus (wonder if he does), and is joined in vocal harmony with Danny Wood. Joseph’s voice feels a little weak here, and a little reminiscent of Robin The Frog, but his harmonies with Danny help to boost it and overall it’s an okay track. The album’s title track Merry Merry Christmas track is up next, clearly a song to all their fans. At times it feels a little reminiscent of something you’d expect to hear from Abba, if they’d ever done Christmas. Again, the Bee Gee-esque vocals jar a bit here, but the rest of the song plods along quite happily. The sixth track is the cover The Christmas Song (Chestnuts Roasting On An Open Fire), which features more high-pitched vocals. Aside from this, the song plods along inoffensively like all good Christmas karaoke backing tracks do. Nat King Cole can rest easy in his grave. Second single Funky Funky Xmas is up next, ‘Throw your hands in the air pause. Kick the ballistics Santa Claus’. They sing. This track might have been the second single, but there’s little musically here aside from some percussion and a bassline. Hand-claps keep the track moving, but the track is quite down-beat, which doesn’t feel very Christmassy overall. This is a very boring self-congratuatory song. The classic White Christmas is up next, with Jonathan Knight making his first credited outing on this album, taking the lead vocals. He does a pretty good job at it too, although nothing groundbreaking. This is followed by the classic Little Drummer Boy, which is also pretty standard and faithful to probably all the versions you’ve ever heard of it. Finally, the album closes with a This One’s For The Children (Reprise), which makes more use of the gospel choir, and despite only being just over one minute long, it actually feels more of a song than the album’s opener. Ultimately, this was clearly an album for the fans. Around 100,000 copies of this album was sold in the UK alone, and 2 million copies in the USA. Where are New Kids On The Block Now? NKOTB went on to continue their ride to success, swiftly following this album with Step By Step, the lead single of which became their most successful. Their success began to dwindle in 1990. The group returned in 2007, and have since released further material and toured extensively, but they have yet to return to the same level of commercial success that they found in 1988-1990. Jordan Knight has had moderate success as a solo artist, and Donnie Wahlberg followed his brother Mark (also a former NKOTB bandmate) into Hollywood movies. 1989 UK CHART POSITION: #13, certified Gold. POP RESCUE 2014 COST: £2.99 from eBay. 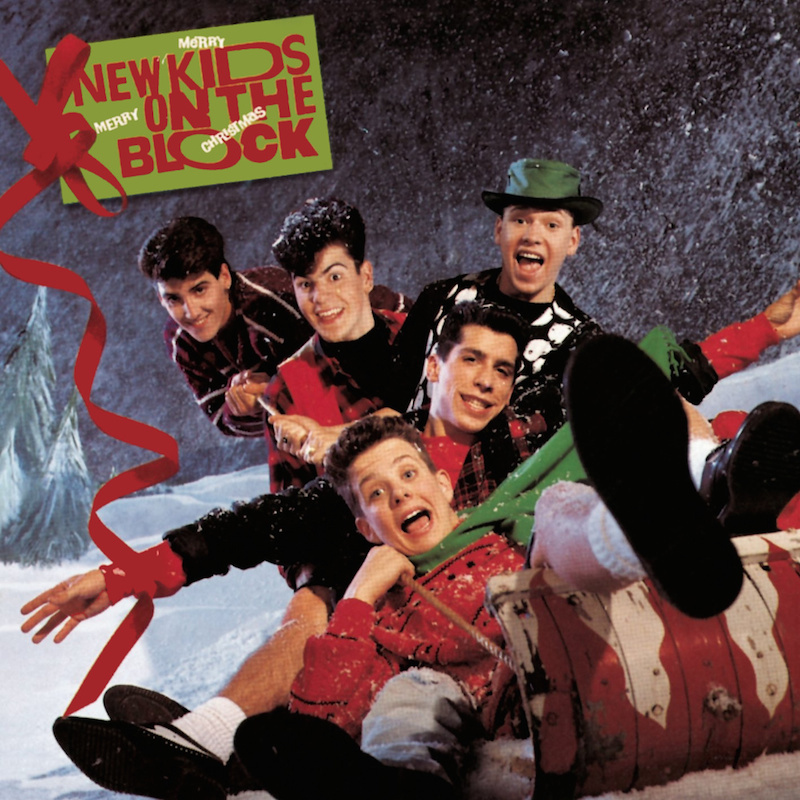 Posted in 1980s, Christmas, New Kids On The BlockTagged 1989, album, Donnie Wahlberg, Funky Funky Xmas, holidays, Jordan Knight, Maurice Starr, Merry Merry Christmas, NKOTB, review, This One's For The Children, xmasBookmark the permalink.